A long weekend! The last bank holiday of the year has arrived and, sad as it is to usher out the end of another summer, at least there’s a three-day weekend to compensate. There’s a fringe success transferring into the West End, a community-driven East London festival, a joyous night of afrobeat, an inflatable obstacle course and, of course, the incomparable Notting Hill Carnival. It’s going to be a good ‘un all right. The Beast is the world’s largest inflatable obstacle course, at a ridiculous 272m long, and it descends upon London this Bank Holiday weekend at Alexandra Palace. With 32 obstacles to conquer and food, drink and live DJs accompanying the action, it’s possibly the most fun you’ll have this year. The Beast is held at Alexandra Palace, N22 7AY, from August 25-28. Tickets are £20 plus booking fee. On the other end of the entertainment spectrum, Late Company transfers into the West End to the Trafalgar Studios smaller space - fresh from a successful run at the Finborough Theatre. A short, snappy one-act play about class, cyber-bullying and the complexities of 21st century parenting, Late Company sees the parents of a recently deceased schoolboy, who took his life after being bullied online, invite one of the bullies and his family to dinner in an attempt at closure. Late Company runs at the Trafalgar Studios 2, SW1A 2DY, from August 21 – September 16. Tickets from £15. Shuffle Festival is a community-driven, not-for-profit arts festival held in Mile End. Acts are sourced predominantly from local talent, and are a mix of film screenings, talks, live music, exhibitions, science and comedy. It’s all held in the glorious surrounds of Tower Hamlets Cemetery Park, and the wide range of entertainment on offer promises a pleasant, stimulating bank holiday activity – and it’s all for a good cause! Shuffle Festival takes place at Tower Hamlets Cemetery Park, E3 4PX, from August 26-27. Ticket prices vary for day/weekend/local residents. Camden’s Jazz Café continue to programme a fantastic array of live music, and to celebrate the 20th anniversary of afrobeat pioneer Fela Kuti’s death, they’ve invited his former bandmate Bukky Leo to perform with his Black Egypt Collective. Kuti contributed an enormous amount to world music and politics whilst defining a sound for generations of musicians to come, and an evening of his music is an evening of life-affirming grooves and beats that are impossible to stay still to. A Celebration of Fela Kuti takes place at the Jazz Café, NW1 7PG, on August 21. Tickets are £10. It’s very difficult to talk about August Bank Holiday in London without mentioning Notting Hill Carnival. Spread over two days and 37 sound-systems, the live music, colourful costumes and enormous parade make for one hell of a party. It can get extremely busy, but if you plan your route carefully (our advice: avoid Notting Hill tube and approach from the outside via one of the surrounding stations) then it’s an amazing day. It’s best to just go with the flow and let the carnival happen to you! 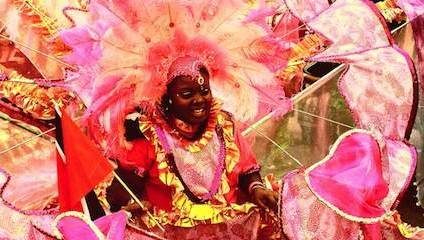 Notting Hill Carnival takes place in Notting Hill on August 27-28.